The Bundesliga is back! After an awfully long Christmas period, football in the German top flight returns. Before the main bulk of the fixtures tomorrow, we were treated to a match between Bayern and HSV in a clash which has panierved up some great Bavarian performances in past years. However, we didn’t see such a performance in the first game of the Rückrunde as Bayern failed to meet their usual high standards. Albeit they were the better team between the two, we didn’t see the dominant performance we have come to expect from Guardiola’s men. Under Guardiola we have seen Bayern take on many shapes in the three years the Catalan manager has been at the helm and in today’s game they alternated between two shapes. With the ball, they would shift into a structure resembling a flexible 3-2-4-1 formation with Alaba in the first line beside Badstuber and Boateng whilst Lahm would join Xabi Alonso on the next highest. This variable shape allowed Bayern to organise themselves in strong structures both in and out of possession and they switched between the two with impressive fluidity. These beneficial shapes aided their control of the game with and without possession even if they were not able to assert their usual superiority through the match. Given the quite contrasting shapes, a distinct shift was required in defensive transition which for most teams could provide hazardous if the co-ordination isn’t at a very high level. However Bayern’s strong transitions made such a shift possible with high stability as their counterpressing was particularly strong. The very aggressive attacking structure of a 2-3-4-1 allowed for strong access upon losing possession so they were quick to surround the ball-winner and if they couldn’t immediately regain the ball, they could at least restrict HSV from springing a counter-attack. This base structure gave Bayern a useful level of attacking variability as they not only had strong central occupation through the quintet of Lewandowski, Thiago, Muller, Lahm and Alonso but also a high presence in the wide areas too. The source of this flexibility came in some ways from their occupation of the half-spaces across particular players. Within their 3-2-4-1 formation, we would see Lahm, Thiago, Muller and situationally Alonso, Alaba and Boateng all acting within one of the half-spaces during possession. Due to the position on the pitch, this allowed these players to be highly active during possession game as they could support roughly in three of the five columns on the pitch – the centre, their own half-space and their near-side flank. If you combine this with the ball-orientation of positional play and Bayern have the potential to create strong overloads in all areas of the pitch in a stable manner. In turn this provides serious issues for Hamburg’s defensive tactics. Due to Bayern’s variability their faced with a very difficult situation in the spaces they prioritise without possession. If they look to control the centre with a high occupation and structural focus do they leave the wings open to overloads and if they look to cover all areas of the pitch, how do they protect the centre against the inevitable overloads through the middle? Of course Bayern’s structure was not rigid as a 3-2-5, however the base structure facilitated a highly variable attack which gave Guardiola’s side versatility in attack, even if it was not often used throughout the tie. Especially across the five attacks one could see multiple rotations of positions as is expected from a Guardiola side. In a number of instances Müller would shift over towards the left half-space where he could find possession unmarked as Coman opened room for him by stretching the man-oriented Hamburg. As I mentioned in the introduction, Bayern were far off their usual game and particularly so in attack as they struggled to create chances against an improved HSV defence. They struggled to find clean access into the penalty area and they could be considered slightly too wing-oriented in many scenes. 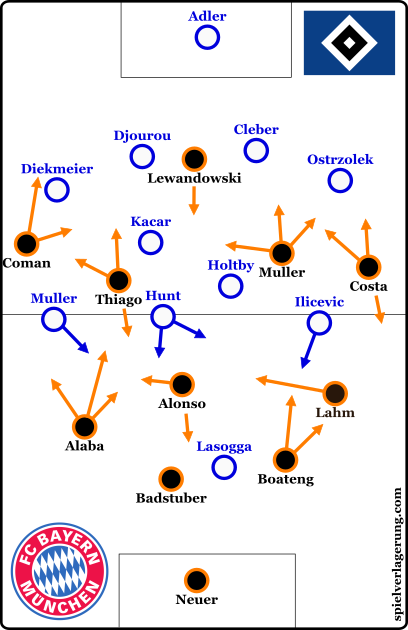 Without the ball, Lahm moved into the defensive line as the right-back, the other three shifted leftwards and David Alaba took on the position of left-back. Xabi Alonso became the lone pivot whilst a pairing of Thiago and Thomas Muller took either 8 position ahead of him whilst Coman and Douglas Costa occupied fairly standard wing positions. As per the usual, Hamburg defended with a high energy as they often looked to regain the ball quickly and in high areas. Throughout the Hinrunde we had seen Labaddia form his side in a 4-4-2 shape but against Bayern, possibly to have a greater occupation and higher pressure of the midfield, we saw them in a staggered 4-1-4-1 shape. This saw their wingers in advanced positions during Bayern’s build-up and gave them generally good access to press opposition defenders. The midfield trio held some flexibility in it’s shape and was largely dependent on the phase of possession Bayern were in, with Holtby able to act as an 8 to provide pressure higher up whilst also potentially supporting nearer Kacar in a 6 position. A key component of Hamburg’s defensive strategy was their high level of ball-orientation in pressing. Although they often lost shape due to the man-orientations across the scheme, they generally held a tightly-knit block with short distances between each of the forwards. The narrow wingers created a nicely-compact centre with Lasogga and the central midfield support which allowed them to press Bayern quite well. In summary Bayern were below their usual standards but still at a good level which saw them get past HSV, even if it was not as dominant a scoreline as they are used to. Their alternation between shapes was not only interesting to watch but provided security throughout the game which ultimately was important in the result of the game.